Wow. Investing sure is easy in recent years! Just look at the chart below which shows that the the S&P 500 has provided average annual returns of over 18% over the last five years (assuming you were fully invested in March of 2009). Many investors have already forgotten the near corrections in 2010 & 2011 as it has been pretty smooth sailing over the last three years. Some may even be saying to themselves that "the skies are clear", "there is little risk in investing", and therefore, it is time to buy stocks". Others are saying that since we have achieved new highs in the stock market, it must be "due" for a correction and is therefore time to sell. 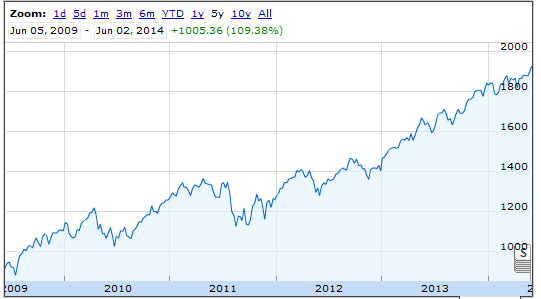 So, having reached all new highs, are we "due" for a correction (i.e. sell), or is the risk really gone (i.e., buy)? So much for easy. Stocks are volatile and will remain so as long as we live in a risky world. Stocks are ownerships in business - and businesses and the environment in which they operate are risky. This is important to remember at times when stock markets only seem to rise. However, downward stock prices move in reaction to big negative surprises - and these surprises don't occur like clockwork and by their nature (surprise) they are unpredictable. The rainbows, sunshine, and unicorns will disappear under a cloud of unknowing. That cloud will be dark, and many will think that the sun will never shine again. The investors who think the sun will never shine again will lose their shirts, while our clients will remember that these bumps in the road are part of the process. Life-long investment success is ultimately determined by our behavior during bear markets, not as much during bull markets (manias are another story). Remember, it is during the inevitable bull market that we simply reap the rewards associated with the risks we bore during the bear markets. We have been rewarded for the extreme risk we bore in 2008-2009. ARE WE "DUE" FOR A CORRECTION? Well, if the risk is not gone, we must be "due" for a correction, right? And if so, we better sell now, before we "lose" any money or worse. ALL our money! Every time the stock market tops a previous high, investors proclaim that stocks are "due" for a correction. While history indeed says we are due, this can not be used as an excuse to try to time the market. This is because over the short-term, anything can happen. Stock markets can remain irrational for a long time. For example, 18 months ago, we were at new highs and investors were clamoring to get out of the market due to fears of dropping off the fiscal cliff. Those that did so, missed out on U.S. stock returns of 37%! So, stocks remain risky AND we are due for a correction, however the only preparations/action you need to make are mental: don't be surprised and don't do anything other than continued rebalancing. Also, know that the correction will not affect you if you have adequate cash and you see the correction it for what it is - temporary and typical.